How will Hollis get out of this one? Hollis Palmer doesn’t want to face Brendan Banks again – the last time he did, he was nearly killed. But Brendan has kidnapped Mia and new friend Carol, who might be the only person who knows how to interpret the data discovered inside a case Hollis stole from Mia’s husband. The good news for Hollis is that he has a plan. The bad news is that he has a knack for screwing up even the best-laid plans – and he just can’t seem to stop making enemies. As if that weren’t enough, the more he learns about the data in the case, the more terrifying it becomes. 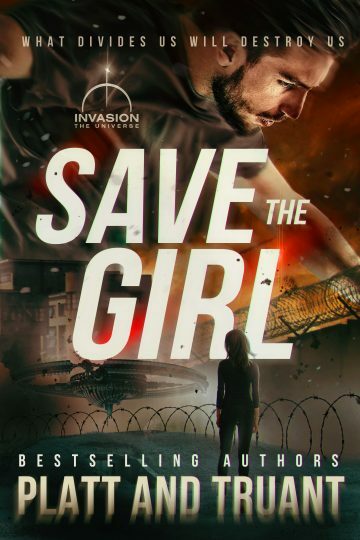 Save the Girl is the second book in Sean Platt and Johnny B. Truant’s new series set in their bestselling Invasion Universe. If you love fast-paced action, witty banter, and plenty of aliens, pick up your copy today!